Why am I seeing this message in the download tab when I am actually watching a video on the page? The "No videos to download on this page" message often means that the video (or website) is incompatible with our downloader for Google Chrome, Edge, and Firefox*. Our Download This Video feature is designed to work with most popular video websites. However, it does not support sites where you need to login to watch a video. 1. Click the arrow icon near the bottom right of your monitor screen to open the system tray. 2. 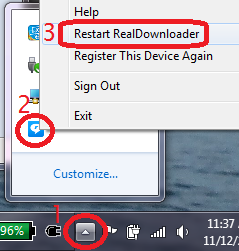 Click the RealPlayer icon. Then, close and re-open your browser. You should be able to download videos again. If the test download works, then you may be able to download your desired video either by using either Internet Explorer or the RealPlayer browser. Click the RealPlayer Logo (at the top left corner). Type the web address and then choose a video. Once the video plays, move your mouse over the upper-right corner of the video. The Download This Video button will appear. Click it to begin downloading. If the Download This Video button is not enabled, right-click on the video and then select the Download This video option. *NOTE FOR FIREFOX USERS: The new version of the Firefox browser allows users to customize where the elements at the top of the browser appear. If you have customized your browser to move any other element (such as the search) to the left of the address bar (where you type in a URL), then the new Download This Video drop-down button will not find any videos to download. The solution is to move the address bar back to the left.